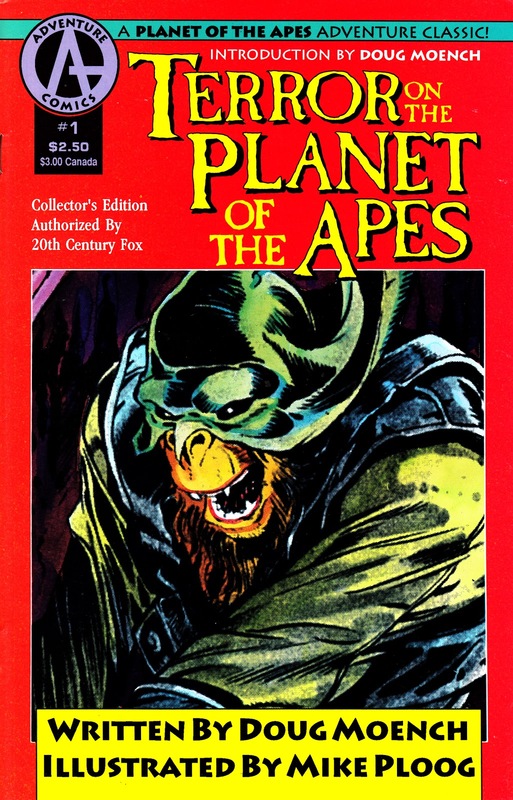 PLANET OF THE APES has been making periodic returns to comics ever since Adventure Comics (an imprint of pre-Marvel Malibu Comics) acquired the license in 1990. 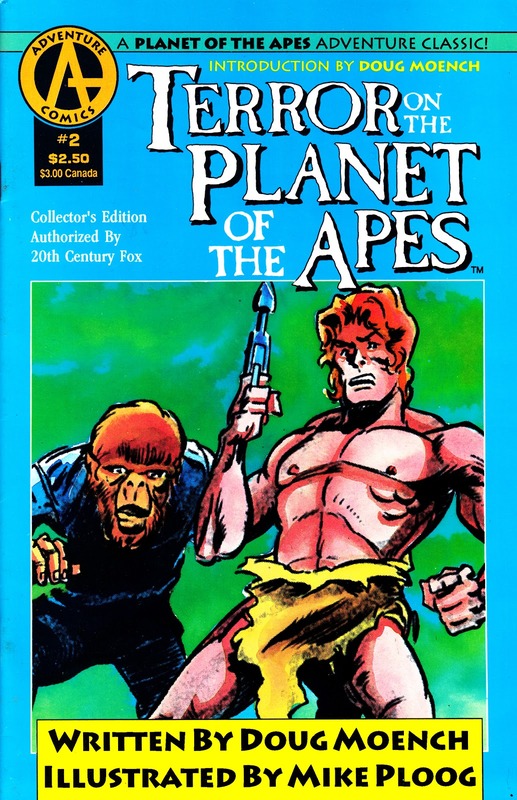 But - surprisingly - no-one has made up of an effort to exploit the Marvel back-catalogue of strips, produced in the mid-seventies for the US magazine (and - briefly - a colour comic book) and the legendary UK weekly. Adventure did dabble way-back-when. 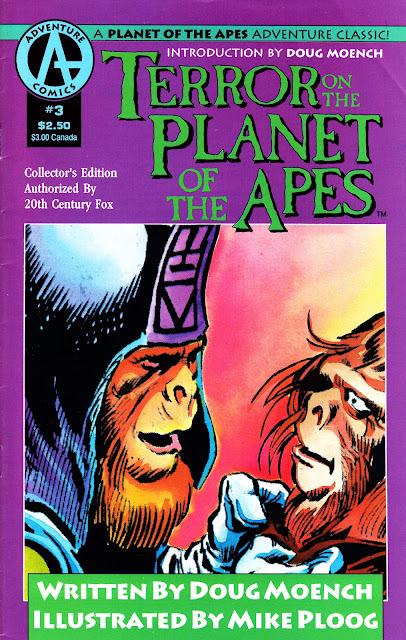 In addition to reprinting some (but not all) of the Marvel movie adaptations, they also released this four-issue black & white mini-series which reprinted the Moench/ Ploog TERROR ON THE PLANET OF THE APES strips from the Marvel era. The strips originally appeared intermittently throughout the run of the US magazine, beginning in issue one and wrapping-up in the 28th issue. In the UK, the strip first appeared in issue 12 and continued, past cancellation, into the pages of THE MIGHTY WORLD OF MARVEL. 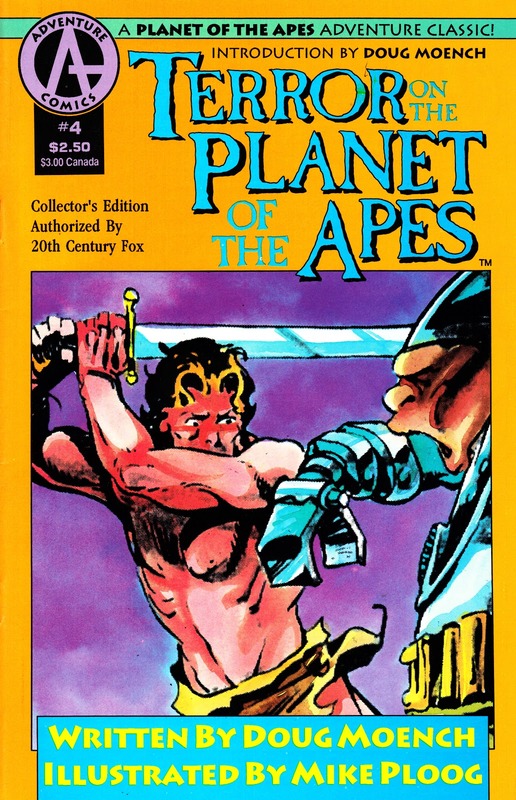 As you'll see, the covers are typically (for Adventure) slap-dash which is surprising considering the amount of great cover art that Marvel produced for the three incarnations of the seventies series. Maybe this helped contribute to lacklustre sales and deterred Adventure from dipping into the archives again. Boom Studios, the current POTA rights holders, had announced plans to reprint this material again but - apparently - they've cancelled the project due to low pre-orders. That's a shame but they probably should look at reissuing the marvel material in book form rather than trying to go the old-fashioned 'pamphlet' route first. A deluxe book edition, or an Essentials-style budget reprint, would surely shift more copies.